To comply with new privacy legislation, we've had to revamp mass distribution of our newsletters. We're giving InternetMailManager.com a shot. So please bear with us for any disruptions in our usual e-mail blasts. overdrive will still be available through our main website. We're also working out a special offer with Performance, Auto & Sound for discounted magazines for our members. Stay tuned for website and e-mail updates about this limited time offer. Remember, you can interact with a lot of Focus owners through websites such as focuscanada.net, focaljet.com, myfordfocus.com, and clubfocus.net. 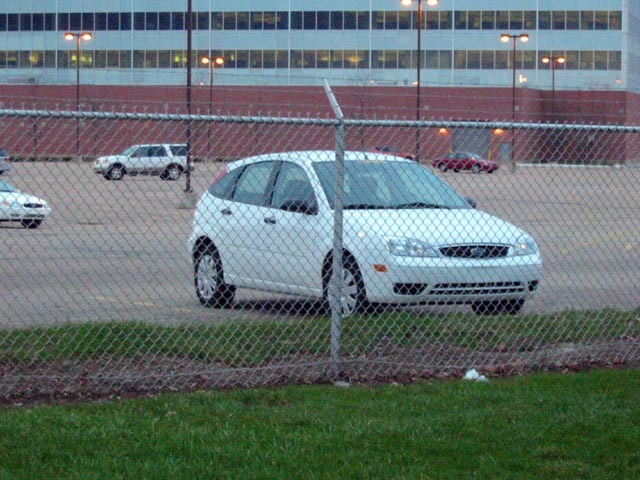 Spotted near the Dearborn Proving Grounds in Dearborn, Michigan, this is the 2005 ZX5. The keen Focus fan will note the is ZX5 is the "SE" line (due to the 15-inch steel wheels with wheel covers). As usual, its design is drawing some strong opinions. Unfortunately, there are no plans for making an SVT version of the 5-door Focus. However, rumours are bumbling about a turbocharged version of a Focus after 2006. Look for the 2005s to start hitting dealerships very soon. This is all part of TSB 03-20-2 and may be covered under your vehicle's basic warranty. Please contact your dealer or Ford of Canada for more information. Join us on Saturday, May 1st at 10:00 AM at Mister Buffer for our 2nd Annual Detail Day. Come out for a chance to clean up your ride for a nice spring day. See some new and familiar Focus owners out at this great event. Mister Buffer is located on 150 North Queen St. in Etobicoke, Ontario. For details, please contact Dean Ellis at (416) 569-3326. Price is $45 for two pulls. AF is an additional $25. If interested, please e-mail richard@ofoc.ca. Hmm...based on all these events coming up, you'd think it's the start of spring! If you're around North Bay, Focus owners are planning to meet Wednesdays at the Tim Horton's located on McKeown Avenue. Contact Adam for more details. Last year, a few OFOC members began meeting every Wednesday night at Mapleview Mall in Burlington. The Mapleview Mall Cruise Night draws a lot of people and some amazing classics and modern street machines. Chances are, you will see some of us there. The Eastern Canada Region of SVTOA will be holding their annual On-Track event at Toronto Motorsports Park (formerly Cayuga) on July 23rd to 25th, 2004. SVTOA On-Track events are performance driving clinics with classroom training and in-car instruction. They allow you to learn driving techniques useful on the track and during daily driving. Plus, you also get to experience the real capabilities of your vehicle in the presence of certified, professional instructors. All SVT and Ford-family vehicles may participate. Registration information will be coming out within the next two weeks. For more information about the event, please e-mail Richard Lee at svtwannabe@sympatico.ca. Show Your Stuff at Spring Fling!! Donway Ford and SVTOA - Eastern Ontario are holding their annual spring show & shine event on May 16th. Entry fee for the event is $5, but 1/2 of the proceeds will be donated to charity. Donations of non-perishable food and unwanted clothing will also be accepted. With close to 50 cars and trucks showing up in 2003, this year's show is looking to shatter the 50-car mark. Come out for some sun, fun, prizes, trophies, and great looking vehicles. Don't forget! For casual meets and g2g's, check out the Meetings and G2G Section on FocusCanada.net. More information may be found on the event site. Want to contribute to overdrive? Send your submissions to info@ofoc.ca.